Whether you seek tranquility, exploration, or exhilaration, you can experience them all on a boating adventure in Naples. With its calm Gulf waters, backwater bays and estuaries, Naples offers superb conditions for boating activities. If fast and furious is how you like to roll, opportunity for thrill-seeking abounds. From the beach, you can consider a number of different watercraft rental options. One zippy way to spend a day at the beach is on a jet ski or wave rider. There are rentals by the hour, half day, or full day, and a guided tour if you want to go wildlife sighting. These machines are ridden by one person who drives the scooter-like vehicle. If you are 18 years or older (or accompanied, if younger) and know how to drive a car, you can drive a jet ski. Just follow all safety instructions and enjoy the ride. If you are the type who enjoys “exercise in motion” the options are many. Instead of sweating it out in the gym with a bunch of other hot bodies, you can work your biceps and triceps on a kayak, canoe, or paddleboard adventure and work those gluteus muscles as the other half of a paddleboat crew. Aside from a great workout, these quiet boating options allow entry into the backwaters for wildlife viewing not accessible to speed boats. Waterskiing and wake boarding are popular motor boating sports. You can rent a small speed boat for this purpose, or to get you out to the reefs for spectacular snorkeling or scuba diving. Check in advance for any licenses required. And watch out for manatees. Getting run over by boat hulls and motors is a common cause of harm. You might consider a dive charter to view the undersea world since they are experts at finding the most exquisite reef locations and have all the necessary equipment onboard. If a party boat for you and a few of your friends or colleagues is what you have in mind, think about renting a pontoon boat. There is a shade cover and you’ll have plenty of seating with ice cooler space for snacks and beverages for about eight to twelve party goers. For that unique experience you absolutely won’t find anywhere else, you can head east from Naples for an airboat ride through the Florida Everglades, the “River of Grass.” There you can have an up close and personal view of southwest Florida’s wildlife. You’ll likely see gators, white-tailed deer and magnificent wading birds. Maybe you’ll even spot some rare orchids and other rare species of plants and animals. There is a range of options for day sailing and you can rent boats of various sizes; everything from small catamarans to Hobie Cats can be rented for scooting around near the shore. If you are looking for something a bit larger and more sea worthy, maybe with a small cabin even, those types of sailing vessels are available, too. As an air and sea combo for the real thrill seeker, you could try parasailing, which is to be strapped into a human sized kite and towed through the air behind a speedboat. This is not for the faint of heart! Yachting is a specialty of the Paradise Coast and you’ll find experienced captains and accommodating ship’s crews in Naples and surrounding areas. And you’ll find yachts of every size, cruises geared toward a cadre of special events, and duration options ranging from a short few hour cruise to a weeklong journey at sea. Dinner cruises offer elegant ambiance and gourmet dining, often with entertainment or dancing. Sunset cruises are the ideal way to watch the crimson sun set into the turquoise waters of the Gulf. If you and your betrothed are looking for an intimate setting in which to take your vows, consider a wedding at sea. From the ceremony to the reception with dining and dancing afterward, it can all be realized on a romantic wedding cruise. And, while you’re in the mode, why not complete the event with a memorable honeymoon cruise. YOU SHOULD’VE SEEN THE ONE THAT GOT AWAY! Whether you are an old salt with a well-worn fishing pole or a novice just learning to cast a line, fishing in Naples’ waters is guaranteed to be a rewarding experience. Deep sea fishing is an exhilarating experience. Local captains know how to make the trip as successful as it is thrilling. The Gulf of Mexico waters teem with fish of every size and hue, whether sport fishing with a “catch and release” prize is what you are after or a trophy to mount is your goal, or you just want to catch that big grouper for the family fish fry, a deep sea fishing adventure offers opportunity for both. Many local chefs will even prepare your delicious catch for your culinary pleasure. Backwater fishing can also provide a rewarding outing. If you don’t have your own, motor boats and skiffs can be rented at numerous locations. They’ll suffice to get you into the bays and rivers for a calm day of casting your line and letting your mind wander until awakened by your pole bending under the weight of your strike. If you are the type of angler who prefers to fish with your feet planted in “terra firma” there are options for you as well. You can fish from the shore or cast your line off the Naples Pier at 12th Avenue South, or at one of many other popular locations. 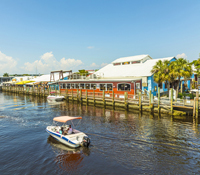 There are numerous locations from which to set launch in Collier Country, some with boat rentals available. Check each location to find the most suitable place for launching your specific water craft. Naples Landings (239-213-1819) is owned by the City of Naples and requires a launch permit or fee separate from the Collier County permit/fee. You can obtain permits from Naples City Hall. You’ll find lots of other options for boat rentals and charters all along the Paradise Coast, both north and south of Naples. Check out the offerings at Tin City and Crayton’s Cove. Most of the rentals and charters require reservations, so keep that in mind while you’re planning your outing. Safety first! Follow ALL laws! Have proper life vests and flotation devices for all passengers. Remember that drinking and boating can be a dangerous mix and you CAN be arrested if you “over imbibe.” Follow speed limits and wake restrictions. Watch out for wildlife. Be sure all passengers stay sufficiently hydrated and protect from the sun. Check weather reports before you depart, as Florida weather is known to change suddenly and waterspouts can pop up without warning. If weather takes an inclement turn while you are on the water, head back to shore. Surely, you would never be one of THOSE boaters who think trash in the Gulf will miraculously go “away.” It doesn’t. Wildlife gets tangled in it and sometimes eats it, much to their detriment and even death. Whether sailing the aqua blue waters, fishing in the deep sea, or exploring the back bays by canoe, Naples is where you’ll find the boating and fishing experience that beckons the “salt” in you. Whether you enjoy the challenge of bunker play, navigating water hazards, the company of local wildlife or just a friendly wide open golf course; you can find them all in Naples.